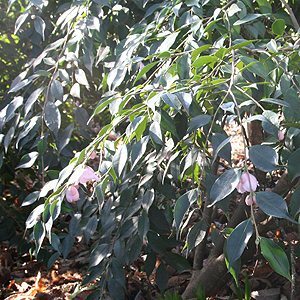 Weeping Camellia plants are not common, however they are available for sale, sometimes as low growing types, sometimes as weeping standards. We are asked about weeping camellia plants from time to time and thought it might be good to cover this topic in a little depth. We are basically dealing with two types, those that have a ‘natural pendulous habit’ such as ‘Wirlinga Bride’ pictured right, which is a wonderful white flowering hybrid with graceful arching foliage. Masses of flowers and excellent as a specimen in the border. And then those that are really naturally low growing and sprawling, and are then grafted onto an upright rootstock. The grafted ones are the those that are generally sold as the standard weepers. 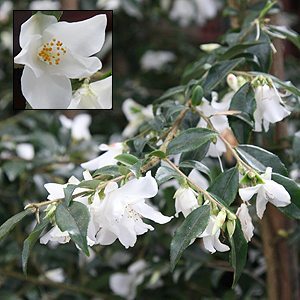 In terms of those with the best pendulous habit, those that are readily available, the white flowering double‘Early Pearly’ is a lovely specimen. Another with an upright main stem growth habit but pendulous weeping foliage is ‘Mandy’, very pretty small soft pink flowers. One with a really loose habit is ‘Our Melissa’, pictured middle right , pink flowers and excellent to growing near a rock wall. ‘Sweet Emily Kate’ is another. 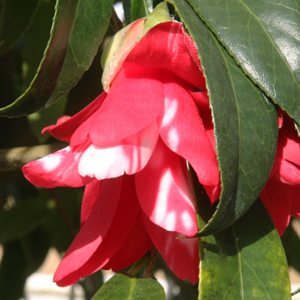 And what about Camellia japonica ‘Hakuhan-kujaku’,pictured right, which also has a nice pendulous habit so it qualifies as well, is also known as Peacock Camellia. And one with the right name is Camellia ‘Rosaeflora Cascade’ although we would call this slightly pendulous, rather than weeping. These two are great, but unfortunately they are are not readily available for sale. And many of these ‘pendulous forms are great candidates for an espalier, Camellia hiemalis Chansonette is one that you could consider. When people talk about miniature camellias they are often thinking about dwarf growing varieties. And although some camellias are smaller growing than others, dwarf species are simply ‘not available’.